It's Facebook Fridays! for April 15, 2016! This is the week for you to experience the magic of the Bat. 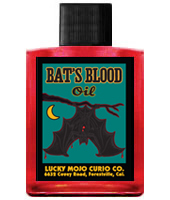 The Lucky Mojo Curio Company is holding a random drawing to give away 11 amazing Bat's Blood spiritual supply prizes for luck at games of chance, and the power to conjure up spells and pacts with spirits! And, rest assured, no Bats were injured in the creation of these products; we love and honour our Bats here at Lucky Mojo. 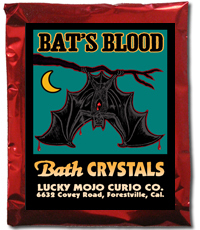 This week the prizes are 4 bottles of hand-made Lucky Mojo brand Bat's Blood Dressing Oil, 3 packets of Bat's Blood Incense Powders, 2 packets of Bat's Blood Bath Crystals, and 2 packets of Bat's Blood Sachet Powders. First thing tomorrow morning, we will select ELEVEN winners at random, announce their names here, and ask them to message this Facebook Page with their mailing addresses, so we can send them their FREE Bat's Blood products. Are y'all going to Facebook to enter the contest? We have a winner! In fact, we have 11 lucky winners! Our Facebook Fridays! winners for April 15, 2016 are: Dani Donatacci, Chris King, Scottie Lee Williams, Jesamyn Angelica, Stephanie Howe, Nikki Kirby, Hannah Froeschle, Raquel Sunshine, Maeve Austin, Helen Gu, and Jasz Canavan.